Have your Rockfon suspended ceiling installed by a Rockfon recognised contractor. We work directly for end users and a sub-contractor. We are aware of our health and safety requirements, hold necessary training certificates, are a ConstructionLine Gold registered contractor, and FIS accredited. Rockfon ceilings are very widely used, and we install huge amount of them through choice. Rockfon ceiling tiles are made from stonewool, and part of the Rockwool Group, they are an excellent product designed primarily to help improve acoustics (they are excellent at sound absorption) in an office, school, or any area with poor acoustics; helping to create more comfortable spaces acoustically. 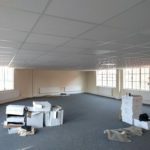 Class A suspended ceilings in schools and classrooms. Sound absorbing ceilings in offices; both open plan and cellular. Shops, Offices, Schools, Industrial Units, and Factories. 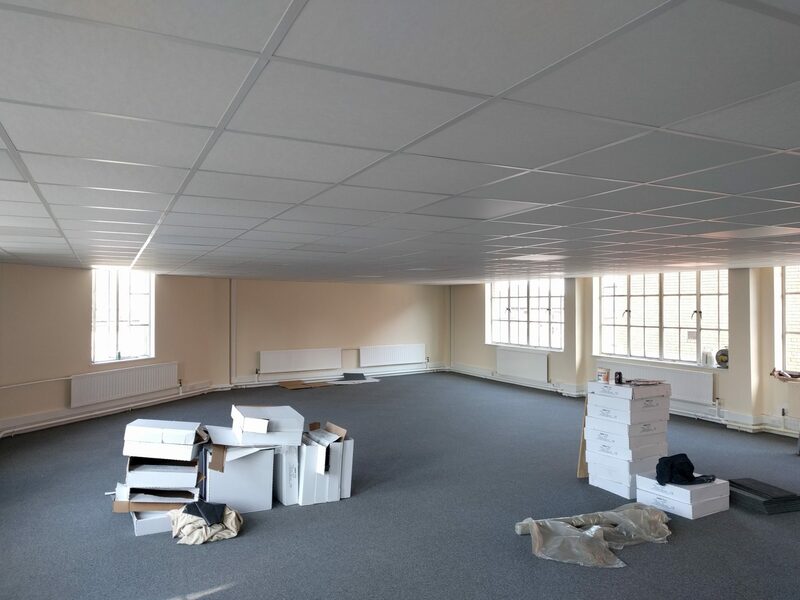 If you have a specified Rockfon suspended ceiling, we would be very pleased to provide you with a quote for it. 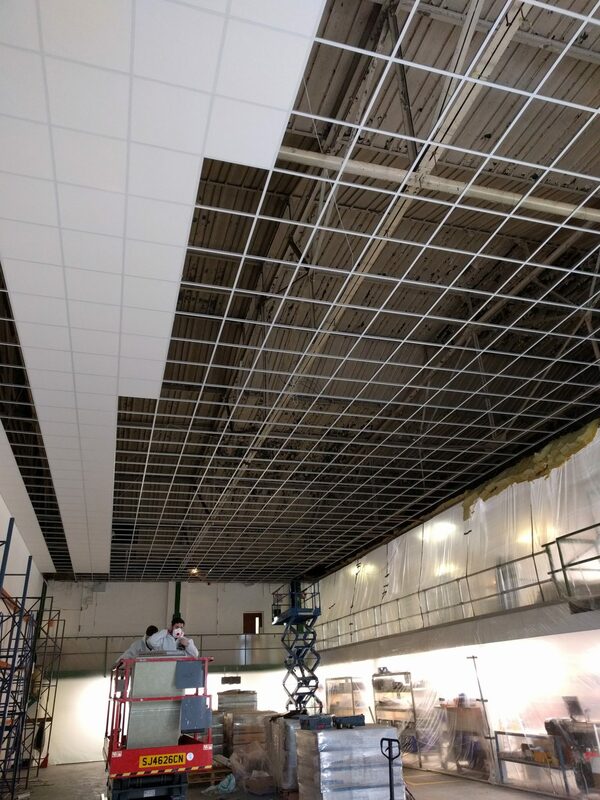 We use Rockfon products (ie Chicago Metallic grid) when installing a Rockfon ceiling solution. 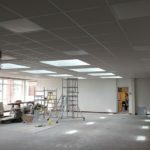 Class A (the highest) sound absorbing ceiling installed for a firm of solicitors. 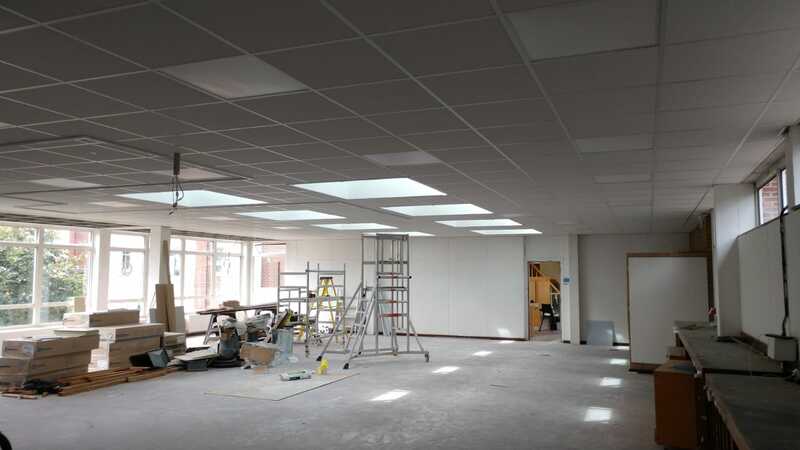 Another Class A sound absorbing ceiling, with integrated skylights, which was installed in the art room of a school. The ceilings are good acoustically, moisture resistant, and lightweight. Their makeup helps limit any spread of micro-organisms. They are excellent in terms of light reflection and how they handle spread of fire (they are essentially made from rock). 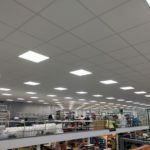 The above tiles usually help with sound absorption although there are tiles available that help with sound insulation; both helping to improve an indoor environment. These have all been installed into Rockfon’s own grid, in either a 15 or 24mm width, and either a 600×600 or 1200×600 module size. 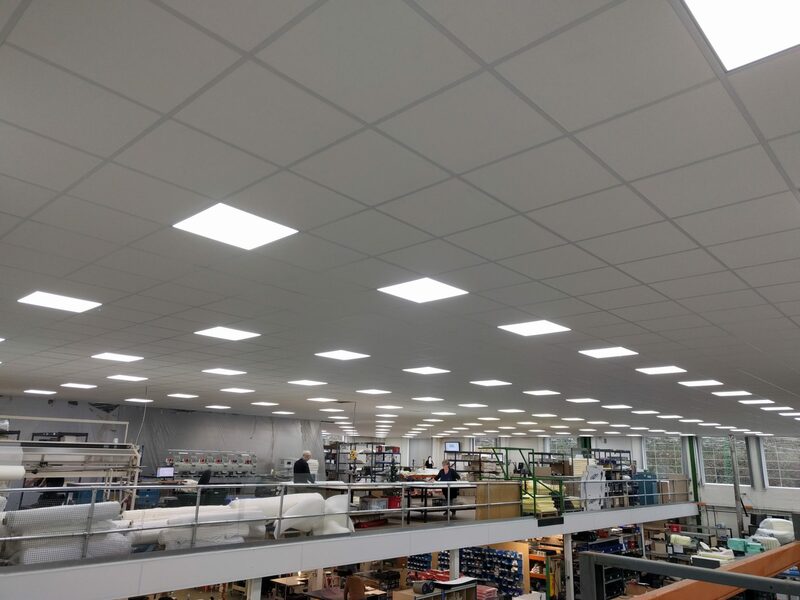 The ceiling products / ceiling panels are available in a wide range of edge details, with A24, E24 and E15 being the most common. 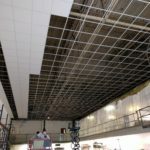 Rockfon also manufacture a wide range of acoustic wall panels and ceiling rafts, which can aid with sound in large areas. If we can provide you with any further information about Rockfon ceilings please do get in touch and we will help as much as we can. We work mainly through Hereford & Herefordshire and Worcester & Worcestershire, covering for example Ledbury, Ross on Wye, Monmouth Bromyard, Leominster, Malvern, and Ludlow and then into Gloucester & Gloucestershire, Evesham, Cheltenham and Pershore area. We do work further away that these areas though, so do please ask!